Spare ribs are one of my favorite things to make no matter what time of year it may be. If the weather doesn’t cooperate or it’s too cold to use the grill outside, baking ribs in the oven can be just as good, if not better, than grilled ribs. I found this recipe from the Food Network’s Amy Thielen, who does a show called “Heartland Table,” for a very unique style of making ribs in the oven with a different glaze to them. I have made ribs in the oven many times in different ways, but this particular glaze she uses really intrigued me so I thought I would give it a try. For the ribs, preheat the oven to 325 degrees. Trim any gristle from the ribs and cut them into two-rib portions. Rub each piece with salt, and sprinkle with black pepper and thyme. Arrange the ribs in a large roasting pan, add 1/4 cup of water, the dried chiles, and the ginger, cover the pan tightly with aluminum foil and bake until the ribs are tender when poked with a fork, about 3 hours. For the porter beer mop, in a food processor, combine the Serrano chile, onions, ginger and salt and process until the mixture is smooth. Heat a large saute pan over medium heat and add the butter. Add the onion mixture to the pan and cook, stirring often, until it is caramelized, a shade darker and fragrant, about 10 minutes. Add the porter beer, molasses, brown sugar and maple syrup and cook at a simmer until the mixture thickens but is still saucy, about 10 to 15 minutes. Add the cilantro, lime zest and lime juice and stir. To glaze the ribs, raise the oven temperature to 450 degrees. Brush the mop on both sides of the ribs and re-apply the mop until you have used it all and the ribs are well coated with a shiny black glaze. Bake uncovered for about 10 minutes before serving. A couple of things about this recipe. 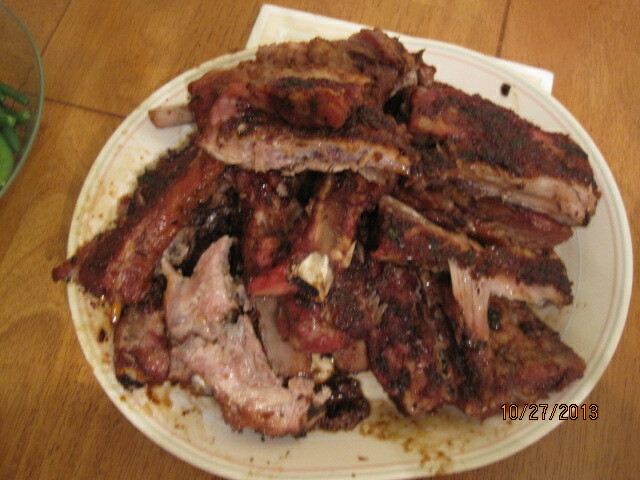 You could use beef or pork ribs for this recipe depending on what you have on hand or prefer. I used pork ribs even though the recipe called for beef and I think they turned out great. Also, if you don’t want the added heat of the dried chiles or the Serrano chile, you could easily omit them or substitute a milder pepper that you prefer. 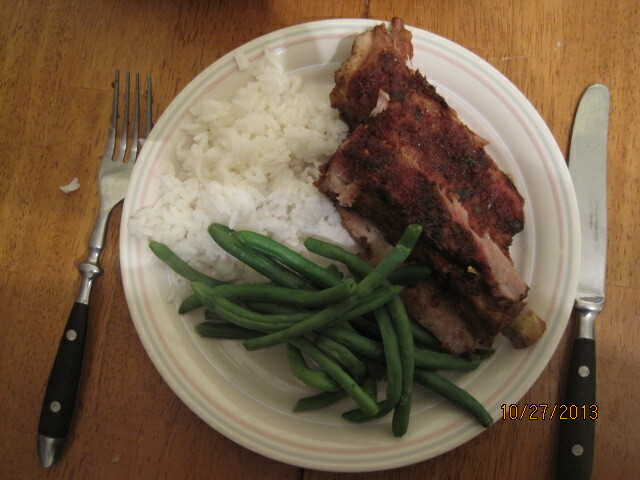 I actually used chili powder in with the ribs instead of the dried chiles and used a jalapeno in the mop and everything was fine with me. You can really get a nice taste from the ginger baking with the ribs and the ginger in the mop and you can certainly taste the beer in the mop as well, so if you like the flavor of a good porter than this one is for you. I served this simply with some white rice and steamed green beans, but some homemade baked beans or cornbread would go really well with this meal as well. I would certainly use this recipe again. One more thing – the recipe is to serve 8 so it is a lot of ribs. You could cut down the portions accordingly to fit a smaller group if you like, or just have lots of leftovers for another meal. That’s all I have for today. Check back next time for some more recipes. I have a bunch of things lined up for this week, including a couple of Halloween ideas for snacks and food, so watch for those. Until next time, enjoy the rest of your day and enjoy your meal!